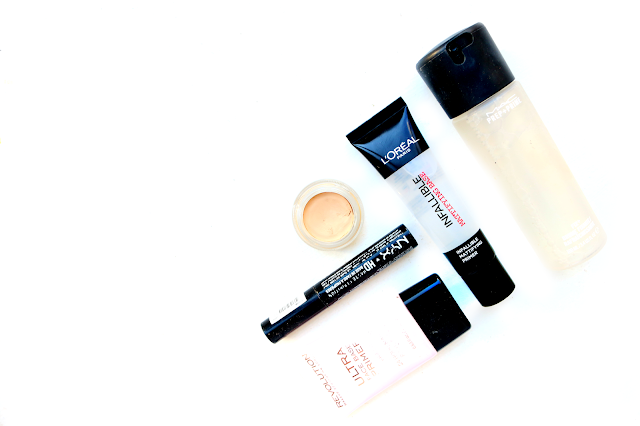 A step that I can't miss in my makeup routine is primer. It's one of the quickest and easiest steps in a makeup routine but even though it's simple, it's so important; if I try to apply my makeup without primer I can really notice the difference. When applying my makeup I use a primer for my face and my eyes and doing this ensures that my makeup goes on easier and more even and also stays put for a longer amount of time without creasing or fading. I definitely think primer is an essential step for improving the look of making for any skin type; if you're dry it will help create a hydrated, smooth base for your makeup and if you're oily priming helps keep your makeup in place all day. These are some of my absolute favourite primers for both my eyes and my face which create that perfect base. This is my most recently purchased primer and it's definitely become one of my favourite facial primers, if not my favourite, of all time. When applying, a little goes a really, really long way and I feel like my tube is going to last me forever. When I rub onto my skin it doesn't feel heavy or very thick at all which when I first bought it made me think it wasn't going to be a substantial enough base but boy, was I wrong. My makeup blends super easily on this base and my favourite thing about it is once my makeup is all applied my skin feels super soft and hydrated whilst still free from oil. This primer is definitely a superior one, I definitely wish I'd bought it sooner and I love the way it makes my makeup look and feel. After a rocky start I am well and truly a converted Makeup Revolution lover. As primer is something I use every day I love this gorgeous one by Makeup Revolution as it is really inexpensive and creates a simply gorgeous texture. On application this smooths out my skin effortlessly and reduces any redness I have as well as keeping my makeup in place throughout the day. This is very, very similar to the Rimmel London Fix and Perfect Primer which I also absolutely adore but the Rimmel London one is just a tiny bit heavier. Sometimes I prefer it heavier, some days I just want something lightweight so if you're looking for a bargain highstreet primer one of these two are definitely your best bet. When I first heard of MAC's Paint Pots I was unsure able using them as a primer as I have quite oily lids and I thought that their textures were very creamy. Upon swatching them in the MAC store I very quickly fell in love as they weren't slippery and creamy as I'd imagined but more dense and matte which for me is a heaven sent texture for an eye shadow base. I find this super quick to apply and it really does hold my eye makeup beautifully in place for the whole day. I'm obsessed with MAC's Fix Plus; it is the product that never stops giving. There are so many amazing uses for this simple spray including creating a base for your makeup. Spritzing Fix Plus over your face before you apply your makeup provides a hydrating, dewy foundation for your makeup- perfect for if you want a natural glow. After applying your makeup use Fix Plus again as a finishing spray for even more fixture. I absolutely adore NYX for value for money. I've never been disappointed by any of their products and this lovely eye shadow base has been the same. It comes in packaging with its own applicator which is very useful if like me you like to have super long nails and you find it hard to scoop product out of a pot. The applicator makes it very quick to apply and I find this primer is great for keeping my eye shadow in place. I will admit, it's not the best of the base bunch but it's super affordable and for everyday wear it is does a perfectly adequate job. If you're looking for a decent eye shadow base for daily wear that you won't be worried about running out of as it isn't too expensive, this is that product. When I got the Urban Decay Naked Palette it came with a free sample of all of Urban Decay's Primer Potions. They have a wide range including matte, shimmer and anti-aging eye primers but the original version is the one that I can't wait to get my hands on and buy for myself. I would definitely argue that this is one of the best eye shadow bases I've tried as my eye shadow literally clings (in a good way) to this primer all night long and my shadows also appear a lot pigmented when they are applied onto this primer. I literally can't fault anything about this little beauty, it does everything it promises and to the best quality. I love the L'oreal infallible matte foundation but haven't tried the primer, sounds fab! The L'Oreal Infallible Primer sounds great. I love that it's not too thick at all but still manages to keep the skin from looking oily! I swear by the L'Oreal primer! It's one of my favourites as well as the Maybelline Baby skin one! I am the worst with primer, I just forget them! Think I need to invest one as a good reminder! I've avoided buying Fix Plus for so long. I've always been really happy with my Urban Decay All-Nighter setting spray, but lately I keep seeing Fix Plus pop up everywhere and I'm taking it as a sign. When you use it do you use your regular primer first and then just spray Fix Plus on top? I love MAC Fix+, I really need to repurchase it. I am desperate to give that L'oreal primer a shot, and how brilliant is Urban Decay Primer Potion? I use it every day!